The skyline of Ibagué in 2015. Location of the city of Ibagué in Tolima. Ibagué (Spanish pronunciation: [iβaˈɣe]) is the capital of Tolima, one of the 32 departments that make up the Republic of Colombia. The city is located in the center of the country, on the central mountain range of the Colombian Andes, near Nevado del Tolima. It is one of the most populous cities in the country, with about 498,401 (according to the 2005 census) inhabitants, making it the seventh (7th) most populous in Colombia. It was founded on October 14, 1550, by the Spanish captain Andrés López de Galarza. The city of Ibagué is divided into 13 communes and the rural area has 17 corregimientos. 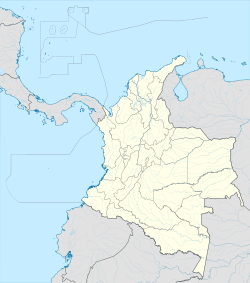 As the capital of the department of Tolima the city hosts the Government of Tolima, the Departmental Assembly, and the Attorney General's Office. It is the main epicenter of political, economic, administrative, business, art, culture, and tourism activities in the area. Plaza de Bolívar, the city's main park. Ibagué is the birthplace of painter Darío Ortiz Robledo, boxer Óscar Escandón, singer Jairo Alberto Bocanegra Pena, soprano Patricia Caicedo, actress Estefanía Gómez, and novelist James Cañón. ^ a b c ""DANE:Proyecciones de Población departamentales y municipales por área 2005 - 2020". (In Spanish)". dane.gov.co. Departamento Administrativo Nacional de Estadística -DANE. Retrieved 23 March 2015. ^ "What are the departments of Colombia". colombiainfo.org. Retrieved 23 March 2015. ^ . (2010). "world trade center ibague" (in Spanish). ^ . (2010). "world trade center Colombia" (in Spanish). ^ colombianparadise (2010). "economía de ibague" (in Spanish). ^ El tiempo (2010). "ibague,ciudad de la confeccion" (in Spanish). ^ ibague es la segunda ciudad negociante del país (2010). "ibague seuna ciudad finanicera y de negocios del pais/web2/joomla/documentos/mapa_comunas.pdf" (in Spanish). ^ conservatorio de ibague (2010). "conservatorio de ibague" (in Spanish). ^ conservatorio del tolima (2010). "conservatorio del tolima" (in Spanish). ^ reinado nacional del folclor (2010). "reinado nacional del folclor" (in Spanish). Archived from the original on 2013-06-19. Retrieved 2013-05-22. ^ "Ingeominas" (in Spanish). Manizales, Colombia: Ingeominas. 1 August 2009. Archived from the original on 26 June 2007. Retrieved 13 August 2009. ^ "Mapa de amenaza del Cerro Machín" (in Spanish). Manizales, Colombia: Ingeominas. 9 December 2008. Archived from the original on 13 October 2008. Retrieved 13 August 2009. ^ "Promedios Climatológicos 1981–2010" (in Spanish). Instituto de Hidrologia Meteorologia y Estudios Ambientales. Archived from the original on 15 August 2016. Retrieved 16 August 2016. ^ "Promedios Climatológicos 1971–2000" (in Spanish). Instituto de Hidrologia Meteorologia y Estudios Ambientales. Archived from the original on 15 August 2016. Retrieved 16 August 2016. ^ "Tiempo y Clima" (in Spanish). Instituto de Hidrologia Meteorologia y Estudios Ambientales. Archived from the original on 15 August 2016. Retrieved 16 August 2016. ^ "Darío Ortiz abrió su 'Ventana al Mundo'", El Espectador, September 29, 2008 (in Spanish). ^ "Copa Mundial de Futsal de la FIFA se jugará en Colombia en 2016". fcf.com.co/. 28 May 2013. Archived from the original on 3 December 2013.